False-color satellite image of the San Gabriel River and the Santa Fe Dam. 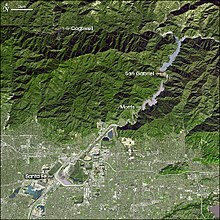 The Santa Fe Dam Recreation Area is a county park located in Irwindale, California, USA, in the San Gabriel Valley, inside the Santa Fe Dam. The park and dam are nestled among gravel quarries in the area, many of which are currently inactive. The dam is a flood-control dam on the San Gabriel River. The dam functions as a dry dam most of the time. The San Gabriels produce more gravel than most other mountains. The park is maintained and operated by the Los Angeles County Department of Parks and Recreation. The park, located off the San Gabriel River Freeway (Interstate 605), contains a 70-acre (280,000 m²) lake for year-round fishing and non motorized watercraft. Fish found in the lake include largemouth bass, bluegills, crappie, and carp. Rainbow trout are stocked in the cooler months, and channel catfish are stocked in the summer months. Some of the rare plants and wildlife found in the river fan include the alluvial fan sage scrub, cactus wrens, California gnatcatchers, scissor-tail flycatchers, horned lizards, and kangaroo rats. The focus of the Santa Fe Dam Nature Center is the plant life and wildlife of the alluvial fan of the San Gabriel River. The nature center is open Saturdays from 10 AM to 1 PM, and is operated by the San Gabriel Mountains Regional Conservancy. Programs include nature and bird walks, nature hobby presentations, insect identification, Tongva cultural history and other special programs. ^ Cara Mia DiMassa (January 16, 2002). "Archdiocese Buys a Hole in the Ground". Los Angeles Times. Retrieved 2012-11-20. ^ "Santa Fe Dam Recreation Area". County of Los Angeles Department of Parks and Recreation. Retrieved 2012-11-20. ^ Dan Slater (2000). "San Gabriel River trail". Retrieved 2012-11-20. This page was last edited on 24 October 2018, at 15:57 (UTC).